Tuesday December 7th 1897 I ironed this forenoon. Will went to town to take the waggon up home. I did churning and other work about the house. Callie was here late in the afternoon. Wednesday December 8th 1897 I was busy doing cooking all forenoon and fixed things about the house in the afternoon. About six oclock the folks came down from home the Ashleys were with them and brought oysters for supper. They stayed till nine oclock. We did enjoy it so much. It was a beautiful night. 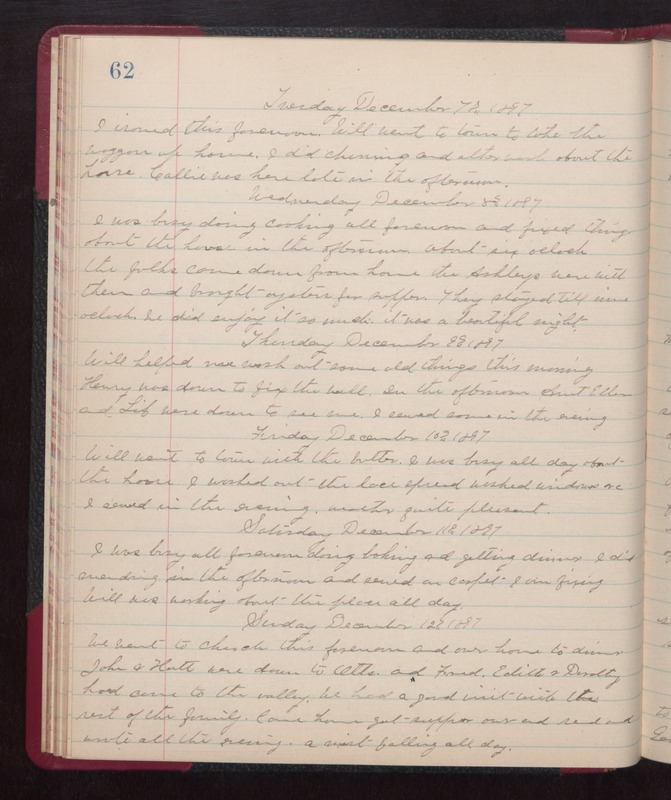 Thursday December 9th 1897 Will helped me wash out some old things this morning. Henry was down to fix the well. In the afternoon Aunt Ellen and Lib were down to see me. I sewed some in the evening. Friday December 10th 1897 Will went to town with the butter. I was busy all day about the house. I washed out the lace spread, washed windows, &c. I sewed in the evening. weather quite pleasant. Saturday December 11th 1897 I was busy all forenoon doing baking and getting dinner. I did mending in the afternoon and sewed on carpet I am fixing. Will was working about the place all day. Sunday December 12th 1897 We went to church this forenoon and over home to dinner. John & Hatt were down to Otts and Fred, Edith & Dorothy had come to the valley. We had a good visit with the rest of the family. Came home got supper over and read and wrote all the evening. A mist falling all day.